The Baden wine region, located within the German state of Baden Württemberg, is Germany's third largest. It stretches from north to south over 240 miles (400 km) along the Rhine River and covers 39,289 acres (15,900 hectares). 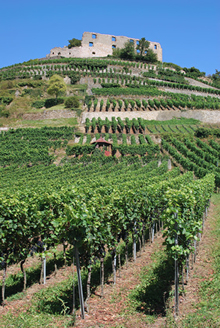 Baden is Germany's most significant Spätburgunder (Pinot Noir) producer. Here, Spätburgunder wines are produced in each style and each ripeness level - including Rosé wines. Baden is considered Burgundy land, growing grapes from the entire burgundy family - the most signficant being the Spätburgunder, Grauburgunder (Pinot Grigio), and Weissburgunder (Pinot Blanc) grapes. 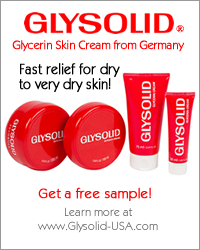 Other significant grapes for the region include the Müller-Thurgau, , Riesling, and Gutedel. Overall, 62% of the region's acreage is used for white grapes, while 38% of the acreage is used for red grapes. The Baden wine region is located in the German state of Baden-Württemberg. It is Germany's most southern wine producing region. The entire Baden wine region experiences particularly warm and sunny conditions, due to the protective Black Forest and Oden Forest. 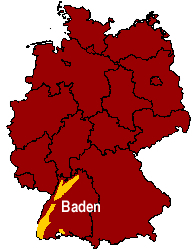 The Baden wine region is divided into 9 districts. Each district has its own unique topography and climate and this results in varying grape and wine characteristics. Ground quality varies from gravel to limescale. 85% of the Baden wine region is cultivated by winery-cooperatives. Baden is the only German wine region to belongs to the EU's Growing Zone B. This zone includes such top wine producing regions as the Alsace, Champagne, and Burgund regions in France. Because of this, Baden wines must meet the EU's stricter wine standards for Qualitätswein bestimmter Anbaugebiete (Q.b.A.) and Qualitätswein mit Prädikat (QmP) wines.